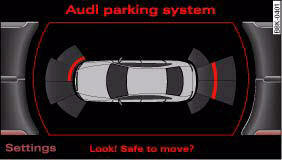 The Audi parking system plus is a parking aid with acoustic signals and graphic display. The acoustic signals sound with increasing frequency as you approach the obstacle. A warning tone will sound continuously when the vehicle is less than approx. 0.30 m away from the obstacle. Stop moving immediately! – Switch on the sound system or MMI*. – Press the switch ; in the centre console ⇒ fig. 185 or next to the selector gate. You will hear a brief acknowledgement tone and the diode in the switch will light up. You can estimate the distance to an obstacle by referring to the red segments at the front and rear of the vehicle, fig. 186. The closer the vehicle gets to the obstacle the closer the segments move towards the vehicle in the graphic. At the latest when the penultimate segment is highlighted the vehicle has reached the danger (collision) zone. Stop moving immediately ⇒ ! 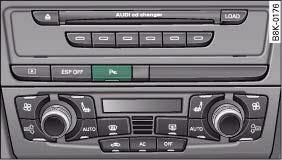 • You can change the display and adjust the volume and pitch of the beeps.